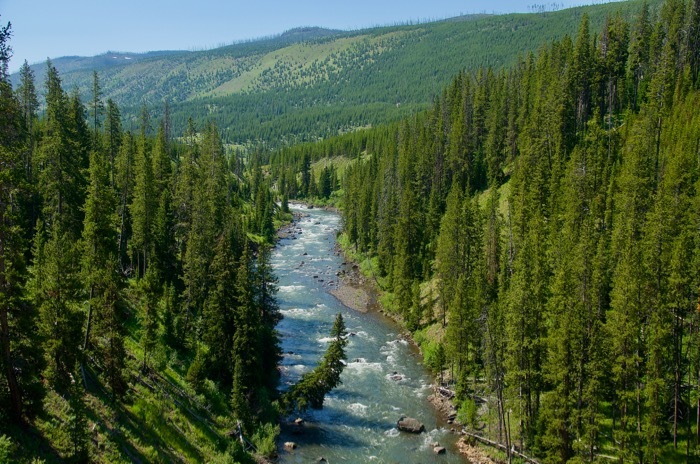 The upper Lamar River in Yellowstone and its tributaries cut beautiful valleys through the mountains and plateaus of Yellowstone’s northeastern backcountry. Sometimes called “North America’s Serengeti”, this is usually a great area for viewing wildlife! Bison, elk, pronghorn, mule deer, and bear are abundant, and this is the exact area in which wolves were first re-introduced into Yellowstone back in 1995. It is still not at all unusual to hear them howl or even to catch a lucky glimpse. This Yellowstone landscape is a rich mix of verdant wildflower-strewn meadows and young forest dating back to the 1988 fires, plus areas of deep shady old growth. Big rocky peaks tower above the Yellowstone valleys, and the clear cold streams are loaded with fish. 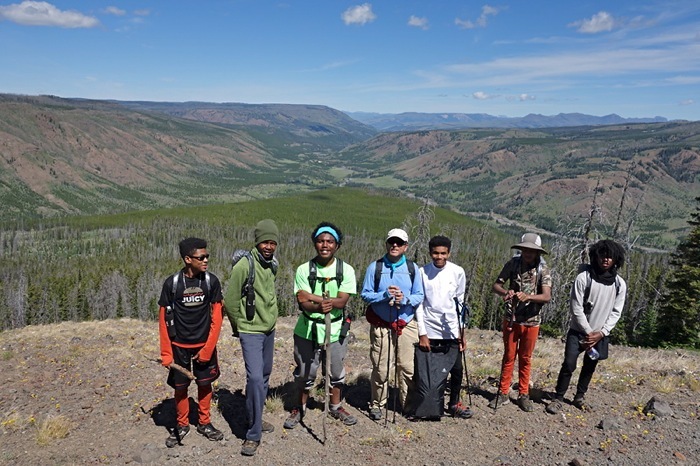 This Yellowstone guided hike will take you to the headwaters of the Lamar, cross an Absaroka Range mountain pass, and end the trek near Yellowstone Lake. We rate this trip moderate to fairly strenuous, and its base is Gardiner, Montana. 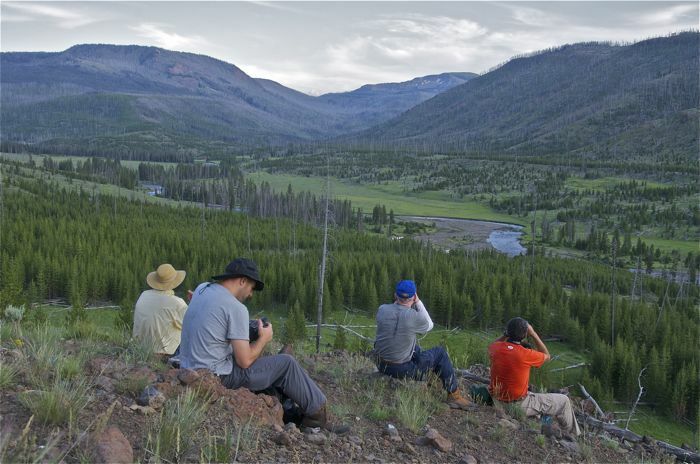 This Yellowstone backpacking trip includes big portions of the upper Lamar and Pelican Valleys; both are important centers of wildlife activity. Trail gradients are mostly gentle but with numerous moderate ups and downs on this guided hike, and the last day we’ll be backpacking about 11 miles on a gentle well-marked trail. TRIP BASE: Gardiner, MT: Comfort Inn, Route 89 Gardiner MT, phone (406) 848-7536; gm.mt411@choicehotels.com. Mention that you are a Big Wild client for a 10% discount. If you need a night in Bozeman, we recommend the Bozeman Comfort Inn at 800-587-3833 or 406-587-2322. MEETING TIME: Pre-trip orientation plus food and gear handout and safety talk are at 6 PM the evening prior to the first trip day, at the Gardiner Comfort Inn. TRIP RATING: This Yellowstone backpacking journey is moderate to fairly strenuous on good trails with rolling ups and downs. Our longest backpack day is about 8 miles (except for the 11-mile last day). ELEVATIONS: 6500-8500 feet. Maximum one-day elevation gain with pack is about 1000 feet. YELLOWSTONE WEATHER: Usually lots of sun with warm to hot afternoons and wonderfully cool nights. Afternoon thunderstorms are common, but prolonged rain is not. Nonetheless, Yellowstone weather can change quickly and radically, and depending upon elevation, it could snow or even approach 90 degrees! Click here for a National Weather Service forecast. FISHING: There’s good mostly “catch and release” trout fishing in the streams, depending upon water levels. 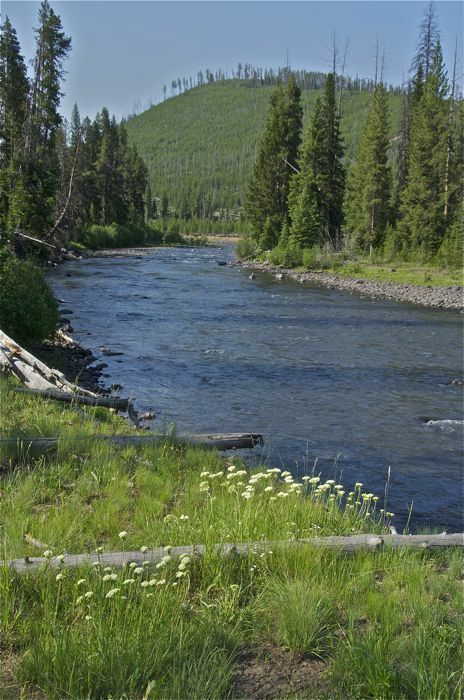 A Yellowstone fishing permit can be obtained when we enter the park. 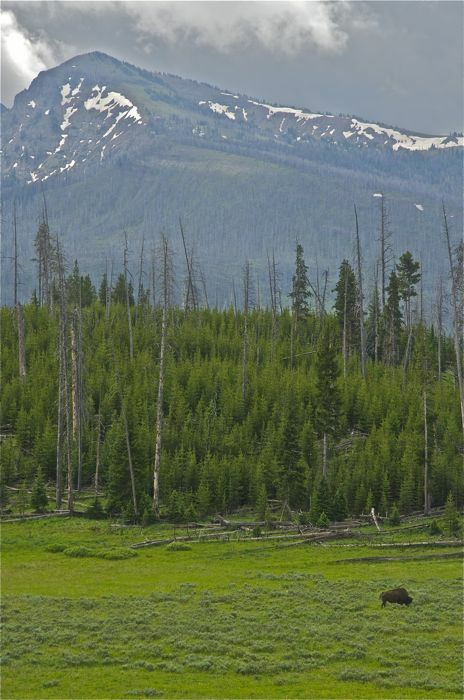 SPECIAL FEATURES: Early Yellowstone summer wildflowers, big open grassy expanses, young forest dating back to the famous 1988 wildfires, shady old growth and rugged snow-capped peaks. Lots of wildlife in Yellowstone: bison, pronghorn antelope, deer, elk, bear and of course the iconic gray wolf, re-introduced right here in the Lamar Valley back in 1995. With luck, we may catch a glimpse or hear them howl. SPECIAL TIPS: A lightweight set of binoculars will be handy for wildlife viewing. Yellowstone is grizzly country, so eschew deodorants and other good-smelling substances! STATUS: The Yellowstone backcountry has yet to be fully protected as a Wilderness Area under the Wilderness Act of 1964, only because of local/regional politics. But it is wonderfully wild. ITINERARY: The trailheads are one and two hours from Gardiner and it’s a “point A to point B” route. 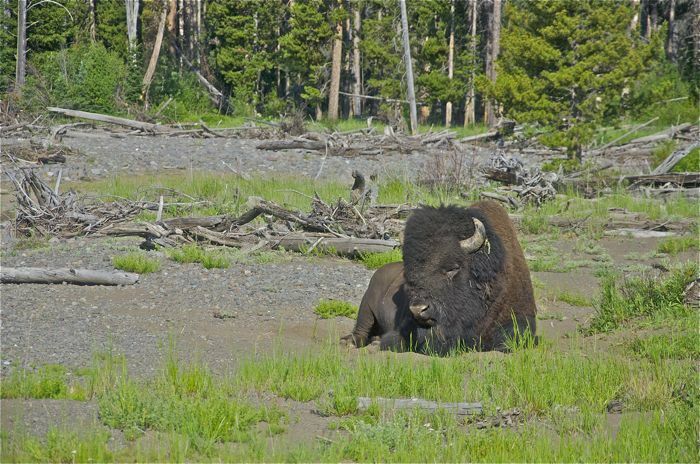 All campsites in Yellowstone are reserved in advance exclusively for our group. Return our homepage to restart your Yellowstone guided hikes trip research and also read about other guided tours. Note: The exact route varies depending upon conditions, so mileages and elevations are approximate, not exact.